The international competitiveness of industries has long been one of the central issues in the literature on business (e.g. Porter 1990) and economics (e.g. Fagerberg 1988). Traditionally, shares in the world export markets are used to measure the competitiveness of industries. However, as a result of increases in the intermediate inputs trade, "the conventional indicators of competitiveness based on gross exports become less informative" (Timmer et al. 2013: 613). This is because a large export share does not necessarily mean that an industry has a large value added if its main production process consists of simple assembly activities, based on imported intermediate inputs. A typical example to illustrate this is Chinese exports of the iPod. Dedrick et al. (2009) focused on the production process of the iPod and examined the distribution of profits across firms that supplied intermediate inputs and other related services. They found that, although the iPod was designed by Apple Inc. in the US and assembled by Inventec Appliances in China, its intermediate goods came from various firms in various countries. As a result, the value added (measured by the operating margin) was distributed across these firms in different countries. Lead firm Apple in the US earned 11.8% of the operating margin. The remaining margins were shared by such firms as Samsung Corporation in South Korea, which provided primary memory (9.4% of the operating margin), TDK Corporation in Japan, which provided the battery (7.6%), Japan Display Inc. in Japan, which provided the display (3.9%) and Toshiba Corporation in Japan, which provided the hard drive (3.8%). In China, in contrast, the value added was very low even though the iPod was assembled there.1 This clearly indicates that the iPod being exported from China does not necessarily mean that all of the value added of the iPod is distributed to Chinese factory owners. In light of the increasing importance of the intermediate inputs trade, Timmer et al. (2013) examined the competitiveness of industries, measured by global value chain (GVC) income, in the EU27 countries. GVC income is defined as the value added that industries contribute to the production of final manufacturing goods. Unlike value added exports, GVC income takes into account the value added that is generated from domestic final demand as well as foreign final demand. Note that developed countries are facing declining domestic demand, whereas emerging countries are facing increasing domestic demand. If such differences are not taken into account, one could overestimate the competitiveness of industries in developed countries and/or underestimate the competitiveness of industries in emerging countries. Timmer et al. (2013) also examined the employment involved in the production of final manufacturing goods, referred to as GVC workers, to examine the changes in demand for skills in the European countries. Using the World Input–Output Database (WIOD) from 1995 to 2009, Timmer et al. (2013) presented two important findings. First, gross exports overestimated competitiveness when industries depend heavily on the imports of intermediate inputs. Second, only a few European countries have been able to combine increasing GVC job opportunities with a substantial rise in real wages. Their study has made significant contributions to the economics and business literature. However, they focus only on European countries. Note that Asian countries may present a different picture to the European countries. For example, Kimura (2006) argued that the development of cross-border production sharing is more advanced in East Asia than in North America and Europe.2 Similarly, Baldwin and Lopez-Gonzalez (2015) pointed out that ‘Factory Asia’ is more like a network and much less like the hub-and-spoke pattern that is observed in ‘Factory North America’ and ‘Factory Europe.’ This is because the processing of manufacturing products often involves stops in multiple nations. Therefore, it is interesting to ask whether there are similar patterns in GVC income and GVC workers in Asia to those found in Europe. A detailed analysis of the competitiveness of industries in Asian countries is needed to better inform the policy debates on globalisation. Given this background, we examined the competitiveness of industries in six Asian countries: China, India, Indonesia, Japan, South Korea, and Taiwan (Kiyota et al. 2016). Following the methodology developed by Timmer et al. (2013), we measure the competitiveness of industries using GVC income. To compute GVC income, we utilise the latest version of the WIOD, which covers the period 1995-2011. This framework enables us to trace the source of the value added for the six Asian countries. Moreover, it allows us to examine the effects of changes in the production of final manufacturing goods on skill demand. Thus, our study contributes to the literature, adding another regional perspective to the available evidence. The major findings of our study are twofold. First, the competitiveness of manufacturing is increasing in China, India, and Indonesia, whereas it is decreasing in Japan, South Korea, and Taiwan. Table 1 shows GVC income for the six Asian countries. The GVC incomes of Germany and the US are also reported for reference. The share of Japan, South Korea, Taiwan, Germany, and the US in the world manufacturing GVC income declined rapidly between 1995 and 2011. In contrast to the developed countries, the share of China, India, and Indonesia expanded rapidly. Even though we focus on the GVC income rather than gross exports, the increasing competitiveness of Chinese, Indian, and Indonesian manufacturing is remarkable. Note: Real manufacturers GVC income is manufacturers GVC income in constant 1995 prices (deflated by the US CPI). Sources: Author's calculations based on World Input-Output Tables, November 2013 and Socio Economic Accounts, July 2014. The US CPI is obtained from OECD National Accounts Statistics. Notes: Change in number of workers and real income per worker between 1995 and 2009 in manufacturers GVCs. Real income is measured as GVC labor income per worker deflated by the national CPI. Source: Author's calculations based on World Input-Output Tables, November 2013 and Socio Economic Accounts, July 2014. 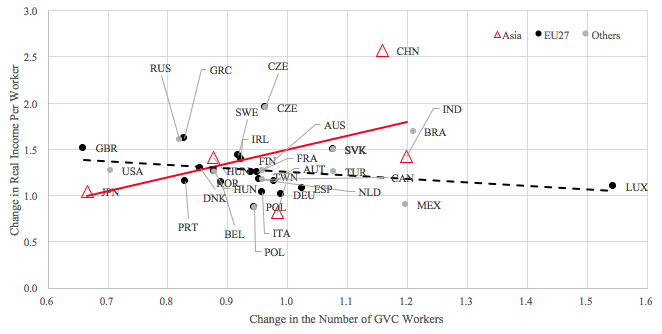 Although a more detailed analysis is needed to discuss causality further, the results imply that, unlike workers in the EU countries, workers in the Asian countries benefit from the growth of the GVC income. Asian countries have generally been able to combine increasing GVC job opportunities with rises in real income. The GVC income in Asian countries thus presents a different picture to that in European countries. An important task for policymakers as well as academic researchers is to identify the sources of this positive correlation and to investigate which policies can help sustain this virtuous cycle. Baldwin, R and J Lopez-Gonzalez (2015) “Supply-chain trade: A portrait of global patterns and several testable hypotheses.” The World Economy 38 (11): 1682-1721. Dedrick, J, K L Kraemer and G Linden (2009) “Who profits from innovation in global value chains? A study of the iPod and notebook PCs”, Industrial and Corporate Change, 19(1): 81-116. Fagerberg, J (1988) “International competitiveness”, Economic Journal, 98(391): 355-374. Kimura, F (2006) “International production and distribution networks in East Asia: Eighteen facts, mechanics, and policy implications”, Asian Economic Policy Review, 1(2): 326-344. Kiyota, K, K Oikawa and K Yoshioka (2016) “Global value chain and the competitiveness of Asian countries”, RIETI Discussion Paper 16-E-080, Research Institute of Economy, Trade and Industry. Kraemer, K L, G Linden and J Dedrick (2011) “Capturing value in global networks: Apple's iPad and iPhone”, University of California, Irvine, Working paper. Porter, M E (1990) “The competitive advantage of nations”, Harvard Business Review, 68(2): 73-93. Timmer, M P, B Los, R Stehrer and G J de Vries (2013) “Fragmentation, incomes and jobs: An analysis of European competitiveness”, Economic Policy, 28(76): 613-661. In a related study, Kraemer et al. (2011) estimated that, even though the retail price of the iPhone 4 (in 2010) was $549, the value captured through assembly in China was around $10 (1.8%), whereas the value captured by Apple was $321 (58.5%). Kimura (2006: 326) commented, "Although we observe similar cross-border production sharing in the US–Mexico nexus and the Western Europe–Central/Eastern Europe corridor, they have not yet reached the level of development that East Asia has accomplished". The correlation is -0.50 for EU15 countries; 0.35 for Asia, excluding China; and 0.21 for Asia, excluding China and India. If we focus on the period between 1995 and 2007, the correlation is -0.087 for all countries, -0.35 for EU27 countries and 0.46 for Asia.